And now, this's my newest wallie. omg, long time to see your new wall ^^, parami-san, you're really a great waller >.<, i love the sakura tree, it's so lovely and the scan is good extraction too ^__^, but the grass is too simple it need to work more. the grass also looks a bit fake but thanks for sharing anyways..
it's very beatiful..this color is very nice.. I like the background very much. 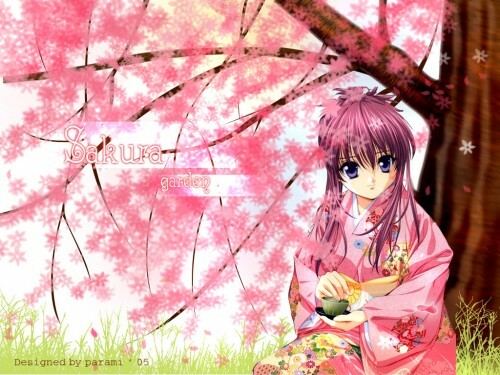 Now this is a very nice pinkish wp.I really like her kimono ^^.You did a very nice job on this one.And thanks for shareing. wow, nice job! you're a very good artist, and the sakura flowers came out really nice! ^_^ favs def. oh and that girl is Chikage from Sister Princess^^. kawaiiiiiii~ the colors used are very pretty...especially the pink. Very nice concept, though the blank background is kind of awkward when I think about it. Nice work! I felt in love with this at first sight! It must be because the gal is so cute and her hair and kinomo fits the background of sakura flowers!